Pros: Excellent musicians performing good songs. Cons: Don’t go if you don’t like Simon & Garfunkel. Don’t be concerned about the lack of signage for this show at the Lyric Theatre – there is only one tiny board advertising The Simon & Garfunkel Story, which has a limited run on the first Monday of each month until December. Despite the cast adopting the look and dress of the duo and delivering the songs in a close approximation to the originals, this is not a tribute band. It is more of a cross between tribute and jukebox musical. 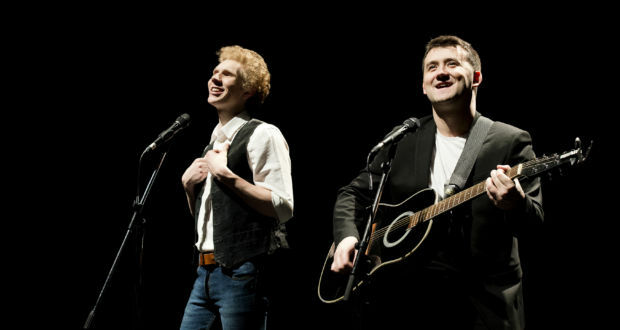 Sam O’Hanlon (Paul Simon) and Charles Blyth (Art Garfunkel) perform the songs admirably and also provide a running commentary, giving some context and a short history of Simon & Garfunkel’s music career. The narrative is delivered in a strangely cheerful and positive manner in welcome contrast to the rather sombre style of most of Paul Simon’s songs. 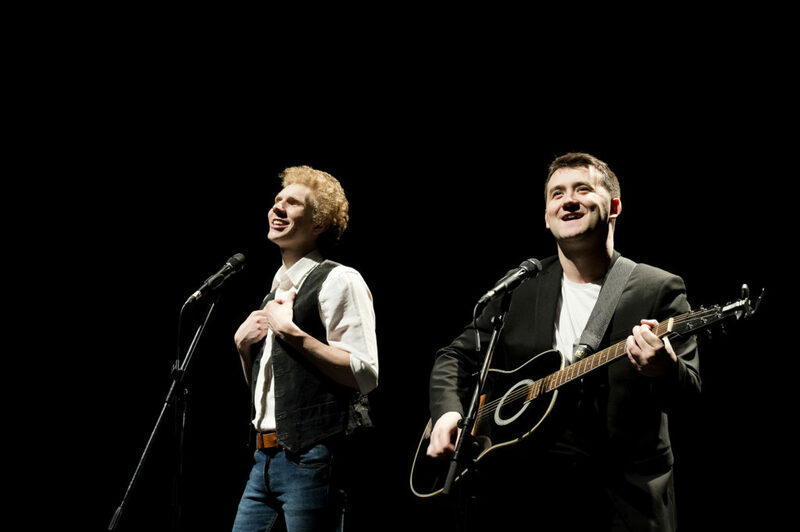 They are accompanied by a team of excellent musicians (Mat Swales – drums; Leon Camfield – bass; Adam Smith – guitar and keyboard) who have solo opportunities during the evening and also perform an instrumental medley of some of the music that couldn’t be fitted into the time – there is a lot of it, after all. My only criticism is that the band are a little bit too loud on occasion, drowning out the singing. In addition to the narrative and music, a selection of relevant photographs, news items, television clips and adverts appears on a screen behind the performers. The blurb I had read beforehand promised ‘huge’ projection photos. Huge is not the word I would use. I realise the proportion of items on stage can be deceiving, but I think there are households with larger TV screens than the one used here. Charles Blyth – who is quite tall – was in my direct line of sight, which meant that I missed half of the screen content. I also imagine it would be difficult to see from further back in the theatre. This is a shame as it is a very interesting extra dimension, giving an insight into events and society at the time the songs were written and released. The show flows smoothly with a good pace and effortless segues between songs. It is easy to forget that the Bridge Over Troubled Water LP was at the top of the charts for a long, long time. There is a broad selection from the comprehensive back catalogue, mostly in chronological order. Unfortunately on this particular evening there were some members of the audience who appeared to have been drinking and just couldn’t keep quiet about whatever nonsense they seemed to want to impart to the rest of us. Despite that, it was a very enjoyable evening that passed quickly and received a standing ovation. If you grew up during the late sixties and early seventies it is worth going for a reminder of just how many hit songs the duo had, and how they have melded into our culture. If you are too young to have been around at that time it is still worth going – you probably know a lot more of the music than you realise.